The RFID Key Fob is an excellent tracking/monitoring tool & is suitable for use in many environments such as transportation management, time & attendance management, access control management, school cards, telecommunications, hotels, entertainment & leisure industry. 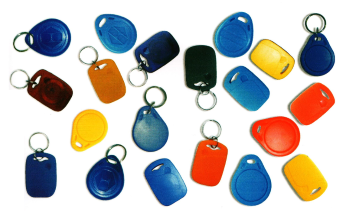 The RFID Key Fobs we supply are available in a variety of colours & sizes to suit all environments. The chips available for the RFID Key Fob are: EM4200, EM4305, TK4100.